As we all probably know by now - I'm a bit of an anti-bac addict. I couldn't tell you how many I have lying around or have used in the past but it is literally countless! I always have one in my bag and am forever trying to find new ones to try so too see a new collection being released had me very excited! You probably all recognise the 'I love...' brand - they have a huge collection out and I always seem to end up with at least one of their Christmas gifts from someone each year! When I heard they were releasing a new range of hand gels I was over the moon - 1. because I'm a germophobe and 2. because their products always smell incredible! 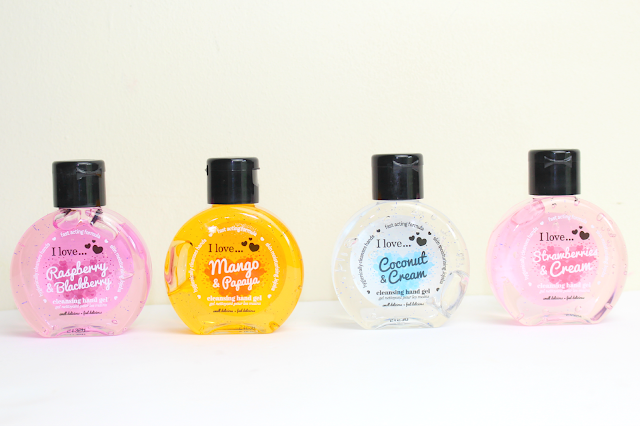 Cleansing Hand Gels in : Raspberry & Blackberry*, Mango & Papaya*, Coconut & Cream*, Strawberries & Cream*. As I had suspected - these hand gels smell incredible! My favourites have to be coconut & cream and strawberries and cream, I love a sweet scent and the smell really lasts. Online it does state that these are an anti-bacterial sanitizer but on the packaging it doesn't, for me this is a little disappointing as I think you'd like to know it is anti-bac when you pick it up and read it. I'd normally only ever pick up a hand gel if it said 'kills 99.9%' of germs - like most do. With the jojoba beads in the formula these leave your hands really hydrated and soft (and most importantly clean!) making these the perfect handbag accessory! At only £1.25 for a 65ml these are a total steal so it's totally reasonable to buy the whole collection! I have never heard of this because I don't live in the UK but the packaging looks really cute. I am a germophobe too and the coconut and cream sounds amazing! Will have to look for these especially as flu season is upon us! I love using hand sanitizer and I've just ran out of the one I have on my desk at work, boo. I do love ones that smell sweet and I really want the coconut one! Favourite scent right now. I love little anti bacterial gels as it is so useful to keep in your bags. These look so adorable, I will have to make sure to pick some of them up, especially the mango & papaya. Oh wow these look fab and so cheap! I always like finding new anti-bac gels that smell nice as I go through so many in my makeup kit! These sound lovely - I love the brand so will have to look out for these in the future!